The success of US boys in junior slams this summer has become so commonplace that four of them reaching the quarterfinals this week at the US Open Junior Championships seems routine. And, in fact, it is, with this the third consecutive junior slam in which American boys make up half of the quarterfinalists. Top seed Taylor Fritz has led the charge, defeating No. 16 seed Stefanos Tsitsipas of Greece 7-5, 6-1. Fritz saved the only two break points he faced in the opening set, which was close and tiring, with heat and humidity again taking their toll on the players. After Fritz held to take a 6-5 lead, Tsitsipas faced his first break point at 30-40. He saved it with a good first serve, but a double fault gave Fritz a second chance. This time Tsitsipas didn’t get a first serve in, and Fritz leaned into a backhand return, rifling it for a winner and the set. The second set was much less competitive, with Fritz taking it in just 27 minutes. Fritz will play another American, wild card Alex Rybakov, in the quarterfinals. Rybakov needed only 20 minutes to win the first set against 16-year-old Canadian qualifier Denis Shapovalov, but the second set was considerably closer, with Rybakov coming through 6-0, 7-6(6). Fritz and Rybakov haven’t played in over two years, with their last encounter in the 16s back draw in Kalamazoo. Paul will play the last non-American to beat Fritz at a slam, No. 4 seed Seong-chan Hong of Korea. Hong defeated No. 13 seed Lloyd George Harris of South Africa 6-3, 6-4, while No. 5 seed Paul cruised past No. 10 seed Corentin Denolly of France 6-3, 6-1, hitting six aces and getting 82 percent of his first serves in. Second seed Michael Mmoh has looked dominant in his first three matches, although he employed a strategy change today in his 6-4, 6-2 win over Akira Santillan of Japan. 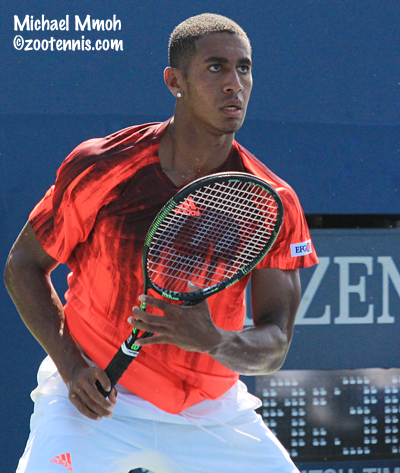 Mmoh will play Australian qualifier Alex De Minaur, who took out No. 9 seed William Blumberg 7-5, 3-6, 6-3. The second quarter of the top half is the only quarter without an American, with No. 3 seed and Wimbledon finalist Elias Ymer taking on No. 11 seed Yunseong Chung. Chung defeated No. 6 seed and Wimbledon champion Reilly Opelka 6-4, 7-6(2). Opelka hit 12 aces, but Chung didn’t face a break point in the match, and Opelka played a poor tiebreaker to help Chung finish it in straight sets. The 17-year-old from Korea started the hard court season in the US poorly, losing in the first round at the Grade 1 in College Park and in the second round in the Grade 1 in Canada, which was his first match as the No. 2 seed, but he has put it together on the courts of the USTA Billie Jean King National Tennis Center. Francesca Di Lorenzo claimed the biggest win of her junior career Wednesday, defeating No. 4 seed and Australian Open girls champion Tereza Mihalikova of Slovakia 7-6(4), 6-3. Di Lorenzo has been working on adding more aggression into her game, which had previously emphasized consistency and physical points, and she found a perfect balance against Mihalikova, who is more than willing to move forward to finish a point. Di Lorenzo demonstrated that new commitment throughout the match, and was particularly impressive in closing out both sets. In the tiebreaker, she went up 5-2, but Mihalikova held her two serves to keep close. With the set on her racquet, Di Lorenzo hit a good first serve to earn two set points, but she only needed one, crushing a forehand winner to take it. Serving for the match at 5-3, Di Lorenzo went down 15-30, but a backhand winner made it 30-all, and some outstanding defense resulted in Mihalikova eventually hitting a backhand long. Di Lorenzo’s missed a forehand long on her first match point and netted a forehand to go down a break point, but an aggressive forehand forced an error from Mihalikova to save it. An unforced error on the forehand gave Di Lorenzo a second match point and this time she converted, with her purposeful forehand drawing an error. 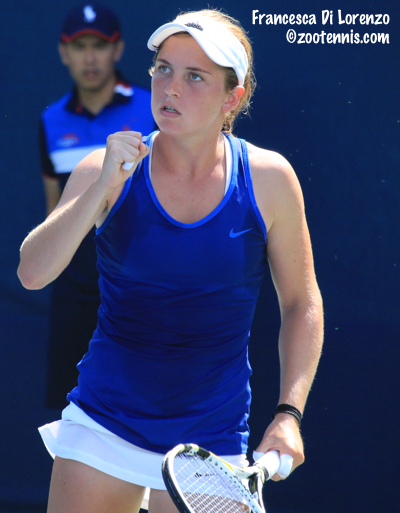 Di Lorenzo will play unseeded Iryna Shymanovich of Belarus in her first junior slam quarterfinal. One girls slam champion lost, but the other in the draw survived, with Wimbledon champion Sofya Zhuk of Russia, the No. 10 seed, defeating No. 8 seed Usue Arconada 0-6, 6-3, 6-3. Zhuk will play No. 2 seed Dalma Galfi of Hungary, who defeated unseeded Karman Thandi of India 6-4, 7-6(3). The top half of the girls draw has two Americans, No. 9 seed Sonya Kenin and unseeded wild card Kylie McKenzie. Kenin, this year’s USTA 18s National Champion, beat Tessah Andrianjafitrimo 7-5, 6-4 with both sets ending with double faults from the French 16-year-old. Kevin will play No. 13 seed Vera Lapko of Belarus, who defeated Viktoria Kuzmova of Slovakia 6-1, 6-3. The final game in McKenzie’s 7-5, 6-4 win over qualifier Valentini Grammatikopoulou of Greece was much more dramatic than the one that gave Kenin her win. McKenzie had served for the match at 5-3 in the second, but Grammatikopoulou broke to give herself a chance to get back even. Grammatikopoulou couldn’t quite seize the opening however with McKenzie earning match point after match point before finally converting. McKenzie will play No. 11 seed Fanny Stollar of Hungary, who took out Elena Rybakina of Russia 7-6(4), 6-4. Stollar and McKenzie played this spring at the Carson Grade 1, with Stollar taking the second round match 6-4, 6-1. The second round of doubles Wednesday was disrupted by rain late in the afternoon, more of which is expected for Thursday. The courts did dry in time to finish the doubles matches however, with the quarterfinals set for Thursday, if the weather cooperates. No singles are on the schedule for Thursday. Top seeds Fritz and Mmoh were beaten by Harris and Yusuke Watanuki of Japan 3-6, 7-6(2), 10-8, and with the loss of three other seeded teams, no seeds remain in the quarterfinals. Two US wild card teams have advanced to the last eight: Sam Riffice and Vasil Kirkov and Brandon Holt and Riley Smith. Two US girls have advanced to the doubles quarterfinals. Arconada, playing with Great Britain’s Maia Lumsden, are the No. 8 seeds, and Di Lorenzo, playing with Luisa Stefani of Brazil, are the No. 5 seeds. Complete junior draws are here. The alternates are Jonny Wang and Ronnie Schneider for the men and Sydney Campbell and Caroline Price for the women. The winners will receive qualifying wild cards into next year’s US Open. Colette, Is there any streaming of the Collegiate Matches or Juniors? I can just see Armstrong and Court 17 on WatchESPN? Hard to believe that the USTA would have ESPN turn the streaming off on other courts. Colette, whats with the us open site not showing the women's draw of the collegiate invitational? I can't find it anywhere, only the men's draw is shown when you drop down the menu to look for what draw you want to view. Annoying.